In between my research stay at the Department of Social Development and my upcoming participant observation at a police station in Pretoria Central, I am busy organising my ‘end of fieldwork-workshop’ that will take place at the University of Pretoria on 25 March. The workshop to whom I have invited representatives from a vast number of organizations dealing with domestic violence and counselling in Pretoria, is an attempt to give something back to my field of study and to express gratitude for the time, information and support that I have received throughout my research. The topic of the workshop will be “Working Towards Social Change. 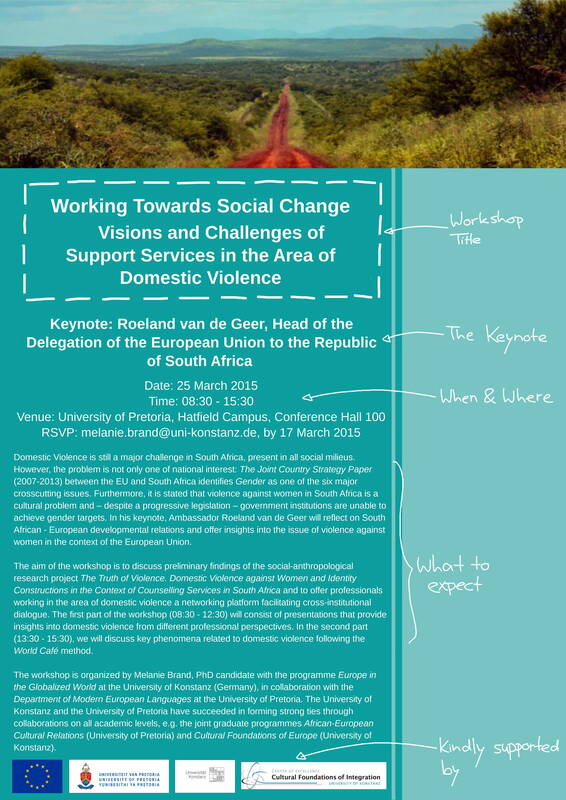 Visions and Challenges of Support Services in the Area of Domestic Violence”. The question, in which ways the researcher should ‘give back’ to his field of study has been widely discussed in Anthropology – foremost in the context of research ethics. By ‘giving back’ I refer to the researcher’s relation to the people with whom (s)he is working throughout her or his research and from whose knowledge (s)he is benefiting: rather than a one-way flow of information and resources privileging the researcher, the relationship should be of reciprocal nature. Anthropologists may choose to link their research to the promotion of well-being, social critique or advocacy. As with all anthropological work, determinations regarding what is in the best interests of others or what kinds of efforts are appropriate to increase well-being are value-laden and should reflect sustained discussion with others concerned. Anthropological work must similarly reflect deliberate and thoughtful consideration of potential unintended consequences and long-term impacts on individuals, communities, identities, tangible intangible heritage and environments. By doing research, we as researchers change our fields, we leave footprints which may be of low or high, short-term or long-term impact. Acting according to ‘the best interest’ of the people with whom we work should be regarded as an ideal that – when attempting to put into practice – is not easy to achieve as possible outcomes can never be fully anticipated. It is also pretty presumptuous to assume that having done fieldwork for a a couple of months or a year puts you in the position to know what is best for others. Therefore, I regard the suggestion mentioned above – namely, to leave it to debate with the people you worked with what could be a good option of giving back something beneficial to the field – as the best way of deciding what to do. During my research on counselling and support services in the area of domestic violence, interviewees often expressed the need for a cross-institutional networking platform. In Pretoria, the vast number of governmental organizations, NGOs and NPOs makes it very difficult for professionals during everyday working routines to keep track of other organizations and initiatives and their specific scope of services. However, as the field of support services related to domestic violence is characterized by a referral system, knowledge of and about complimentary counselling services – like free para-legal support for the application of protection orders – was regarded by members of helping professions essential for effective and successful support. 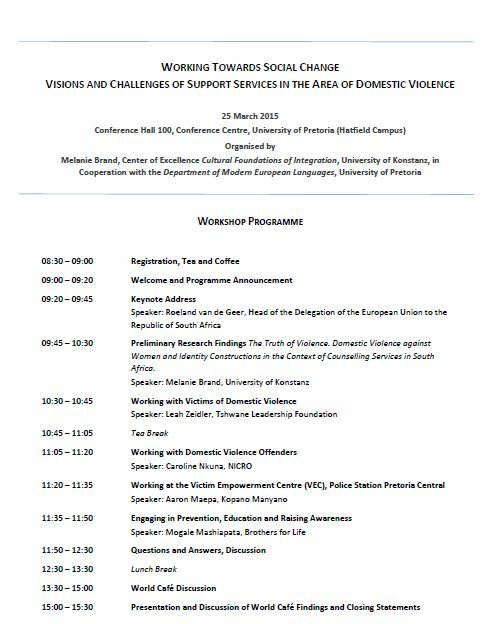 Therefore, I decided to mark the end of my research stay in Pretoria with a workshop that will bring together stakeholders in the area of domestic violence and offer them an opportunity to exchange, discuss and network. Furthermore, I will present preliminary findings of my project and put them up to debate. Although I am very excited about the workshop and the opportunity to meet again the inspiring people whom I got to know in the course of my research, I am also a bit nervous to present my research findings to the expert audience. What, if they do not agree? What, if they feel misrepresented?